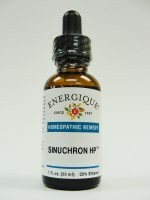 Sinuchron is a high potency homeopathic remedy for the temporary relief of sinusitis and chronic sinus infection, such as chronic catarrh of the sinuses. Arsenicum album 30x, Kali bichromicum 30x, Mercurius solubilis (Hydragyrum) aut vivus 30x, Pulsatilla nigricans 30x, Sepia succus 30x, Lycopodium clavatum 30x, Phosphorus 30x, Natrum muriaticum 30x, Hepar sulphuris calcareum 30x, Hydrastis canadensis 30x, Thuja occidentalis 30x and distilled water. 20% ethanol.